Our DIY roll on deodorant combines magnesium, witch hazel, sea salt and your choice of essential oils to keep you feeling clean and fresh. It is a great alternative to natural deodorants made with bi-carb soda. It is vegan, easy to make and will help prevent and eliminate body odour fast. Magnesium is naturally antibacterial while witch hazel’s dual ability to kill bacteria and rid skin of trapped moisture and oils means it is very effective in controlling body odour. We’ve called this a roll on deodorant, but you could also use a spray bottle. 1 tbsp warm distilled water or boiled tap water. Add the magnesium chloride flakes and sea salt to the warm water and stir to dissolve. Add the essential oils and mix. Pour into your chosen bottle and top up with witch hazel. Shake well. Shake before use. Spray or roll a small amount of your DIY deodorant on your underarms as you would normally use a deodorant. Store out of sunlight and use within 4-6 months. 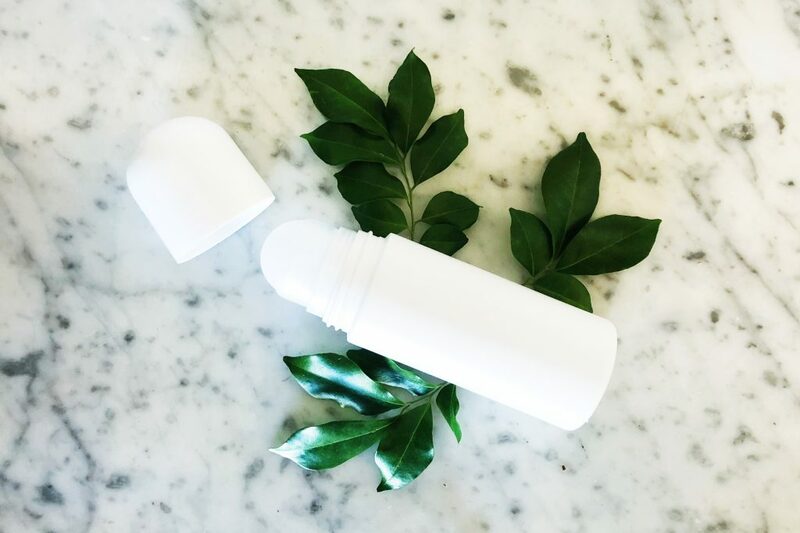 Note: As this DIY roll on deodorant recipe contains magnesium you may feel a tingling sensation when using for the first time. Especially just after shaving. This is completely normal and usually fades after a couple of days of use. When using natural deodorants for the first time after using conventional ones, your body may need to take some time to adjust and detox first. This could take up to 4 days. The trick here is to persevere and before you know it, you won’t go back to old conventional brands. Our DIY roll on deodorant is not an antiperspirant. You will still sweat. This deodorant may help boost magnesium levels and control odour with the help of witch hazel, and the essential oils. This recipe makes enough to approximately fill 1 x 75ml roll on deodorant bottle. Top up your bottle with a little more cooled boiled water or witch hazel if desired. As with all our DIY recipes, you can experiment to suit your preferences. Many factors can change the end result, including temperature, humidity, light, ingredient quality. Some DIYs can be amended by remelting or adding ingredients, but some cannot. Please read the whole recipe before beginning and remember to have fun! Pregnant women should exercise caution when using essential oils. If unsure, please seek medical advice from your health care professional. At Biome’s Naked Beauty Bar, you will find all of the beautiful raw ingredients you need to make your own natural skin care and cleaning products. These ingredients are available in convenient reusable glass jars, and in bulk from our Indooroopilly and Balmoral stores. Share your Naked Beauty Bar DIY skin care and cleaning products with us by tagging your photos with #BiomeNakedBeauty on Facebook and Instagram. Is that supposed to be 1 Tblsp of witch hazel? It says 1 cup, that seems a lot. We will check that and get back to you. It is a liquid deodorant not a paste.